is ACTUALLY the FIRST day of Fall? Yep, it is the Autumnal Equinox. I am not even really in the Autumn "mood" yet. But, the calendar tells me to be. Whether I like it or not! So, here's my first submission for Fall decor. each year the contents are new to me all over again!! Please, someone tell me I am not the only one who does this! Hydrangeas from my tree outside. I wrote about How to Dry Hydrangeas. Sewed one of these to the outside of the tray. Added a vintage postcard I printed on my own printer. And tied it on with jute string. I move it inside, too, because I like seeing the wreath, too! but the weather's still too darn-tootin' HOT here in South Carolina! We could turn the A/C way down and pretend it's a little nippy, if you like. Love your wreath and I really can't remember from year to year what I have in the totes either! Your wreath is really neat! I've never seen one like that before. I'm not really in the fall mood either. What's wrong with me?! I love you door. The red is divine! 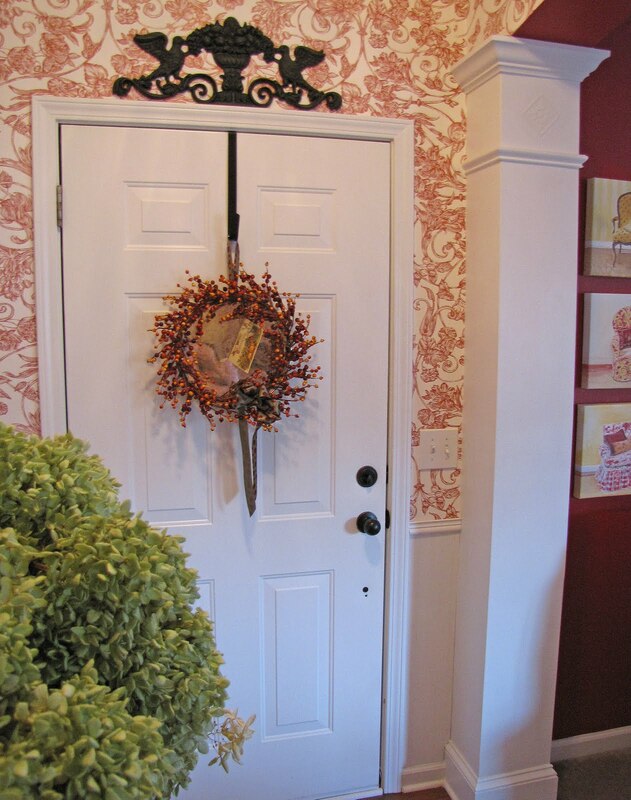 Hi Leslie, What a great idea using the silver tray and the wreath looks wonderful on the red door! I constantly find things I completely forgot about. It's always a fun surprise. Love Love this wreath!! Great job! I have the tray - hmmm berries are next---gotta go find a sticky note so I won't forget to get some! This is the door that says," Welocme to my home." I think it's beautiful! I love the way you used that tray. I wouldn't have thought to do it. Now, I will! Looking forward to the second part in the depression series. That's a great idea, Leslie! I love the way that looks and it is very unique! I am the same about forgetting items packed away, but I have always been like that. I don't know that age has anything to do with it. I also think I packed something away and it turns out I got rid of it! Leslie, look how creative you are. I would have never thought to use a silver tray that way. I love it. Love your front door, too. How clever! No, you're not the only one who forgets what's in boxes. But I do love surprises, don't you? Happy Fall! Ohhh...your autumn wreath is fabulous, my friend! I would have never thought to use a silver tray this way but I just love the idea!!! I will definitely be keeping my eyes out for a retriculated tray! Love, Love, LOVE IT! This is the most unique autumn wreath that I've seen yet! 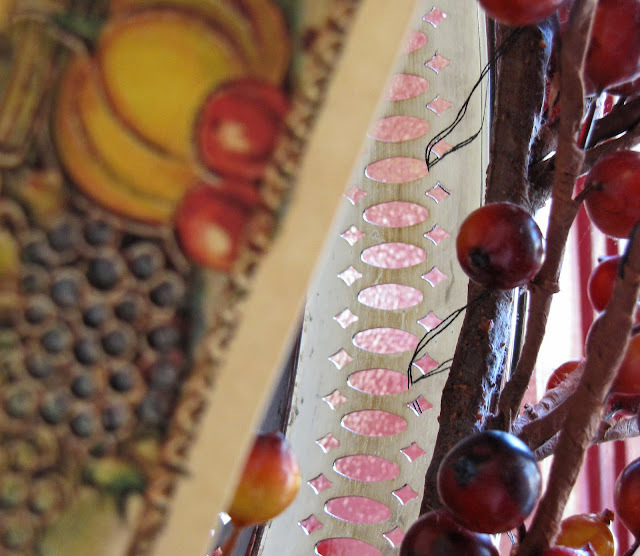 Couldn't help but notice that gorgeous red and white wallpaper...sooo beautiful! Ohhh...and your fabulous red door! Red is my favorite color!!! PS...Girl, I am always doing that! Sticking a box away to later open it and think...WOW! When did I get that! Hehe! Beautiful wreathe, thank you for showing us how to make it. Oh, how gorgeous, and the red door is of course my favorite part. If you ever stop by my page you'll have no doubt. 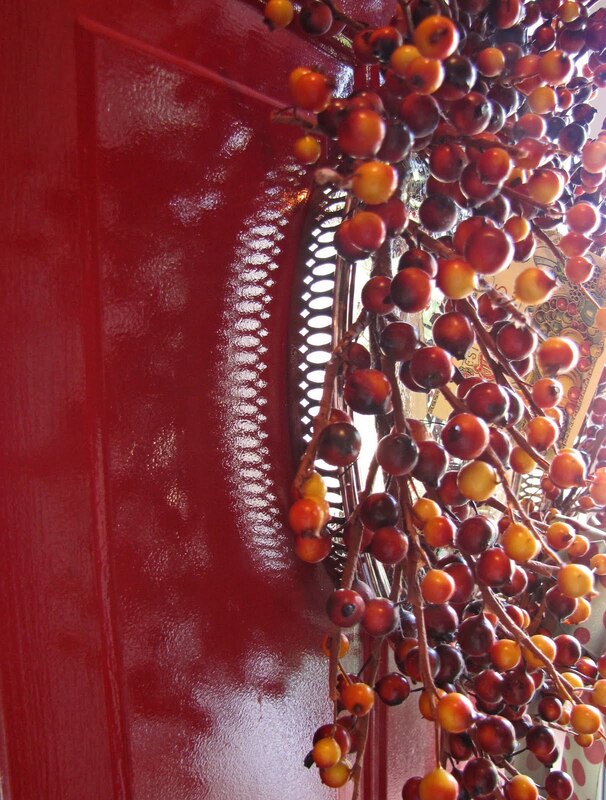 I posted pictures of different red doors a couple of Rednesdays ago. This one is dreamy. By the way, I forget what's in the boxes at times too. Happy Rednesday! It is gorgeous and I love the RED door! All of the photos are fantastic too! I just found your lovely blog and must take a closer look and join as a follower. How could you not remember making that wreath? It's gorgeous, and that silver tray really makes it special! It's nice to have a little bit of sparkle greet you at the door! What a fun idea - love it! It's pretty darn HOT here in AR, too...even if tomorrow is the first day of fall. But I've chosen to praise the Lord for the weather, hot and sticky or crisp and cool :). I just LOVE that! 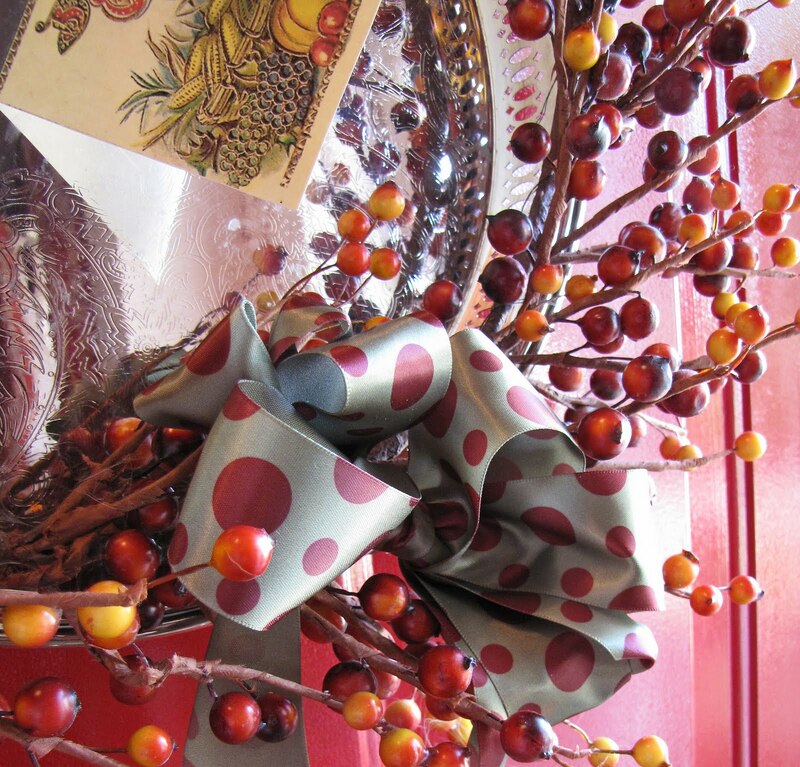 What a wonderful way to greet your guests (and Autumn too)! Love the wreath idea! It's beginning to feel a lot like Autumn....not..thank goodness. I am so not ready for cold! Don't think for a minute that if I lived closer I wouldn't be knocking at your door with the cider in hand. Nothing would beat pulling up a chair and having you to share a personal story with me, summer, fall, winter or spring! Inspiration never goes out of season nor does friendship. funny you forgot about that. i love those fall berry wreaths. I love the wreath. Thank you for showing me how to make it and thanks for the image sites. I knew about graphics fairy and vintage moth but not the others. Thanks for sharing. Okay...Okay...OK! I have to admit that I too...have bought stuff or made things, put them away and forgot all about them. Then when opening the boxes of decor I all Quelle Surprise! It is like getting a gift all over again! 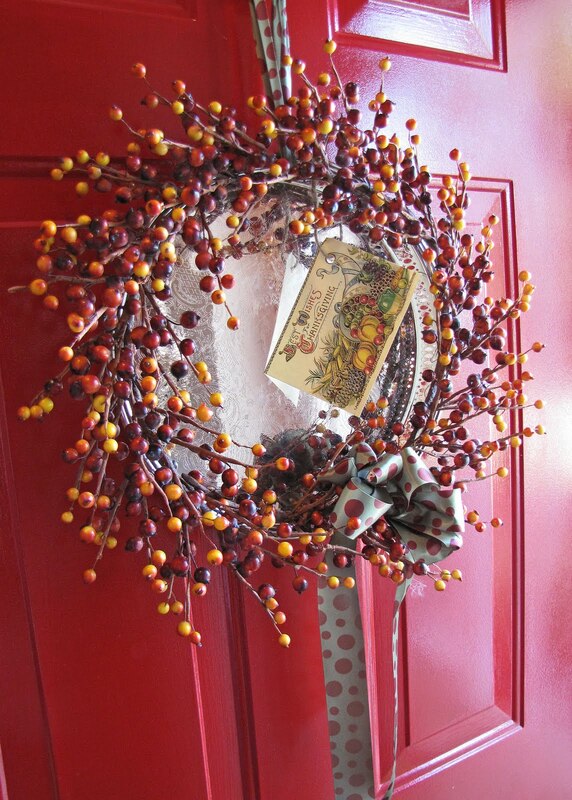 That wreath is so darn stinkin' cauute that I might have to give it a go and get inspired to make one like that for my door..or new door on new house. I wish it felt a little more like fall here, still hot, hot, hot...heard the Devil went back to Hades because Arizona just isn't a fun place to summer vacation! Wow! What a cute idea. I never would have thought to use a silver tray. And the post card! Too cute. Thanks for the share. Cute cute cute! What a fabulous wreath! 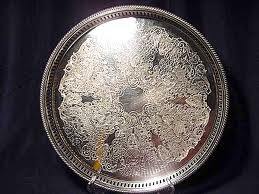 I LOVE that you based it around a silver tray! Ingenious! And your home is so pretty! LOVE the red door! And you...arent you just a doll! I love the Front door, the wreath, and everything else! 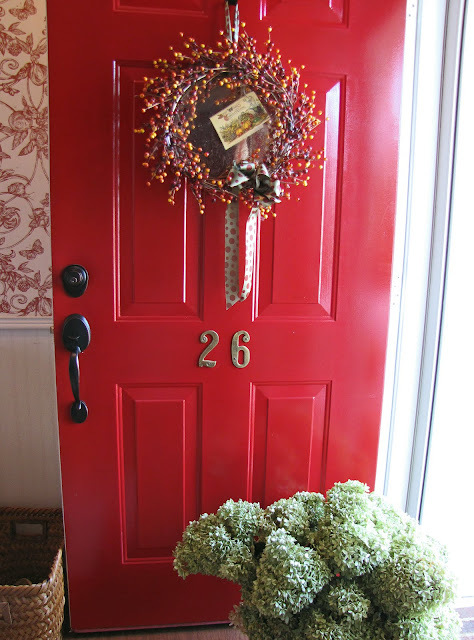 Your autumn wreath is beautiful and those Hydrangeas are amazing! Happy Fall! love the wreath...great idea with the tray! I agree that it sure doesn't feel like fall yet. I'm not far from you in North Carolina...it's in the 90's today. Ack! I can never remember what's in the boxes, so I label them, then pack stuff away in the WRONG boxes, so the next year I think I'm hauling Autumn Pumpkins down from the attic, and find old children's books inside, instead. Your wreath is FABULOUS. What a brilliant idea, to attach the bittersweet vine to the tray. I love it. Thanks for stopping by my little corner and commenting, Leslie. I replied the following at my place for others to read about the header too. Yes, Leslie, the header really is my own cottage. Oh, just kidding. I wanted to see what saying that felt like. :0) That's my clown smiley by the way. For my headers I use different pictures and paintings of what else--houses and cottages. I love them, especially if they have a red door. Credit is given to the artist or photographer at the bottom of my page. 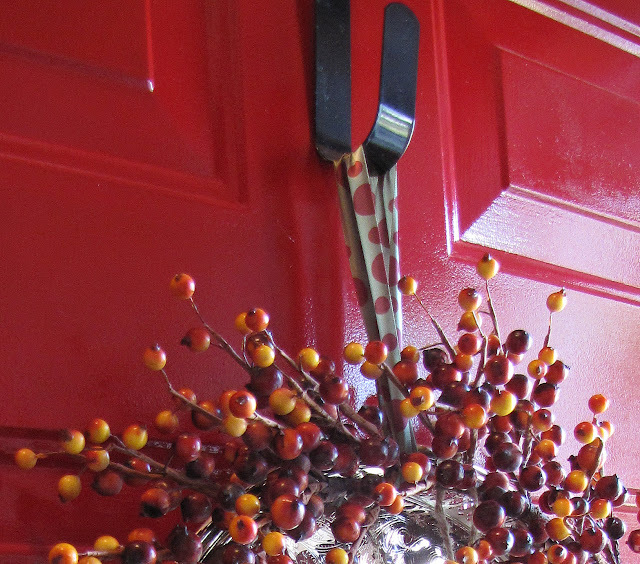 Love the silver tray incorporated into your door wreath...so much so, that I just did mine like it! Hey, that's beautiful! What a great idea, using the tray. In the first picture, I couldn't tell that's what was going on, glad you put the other shots of it in, love the vintage postcard too. Thanks for linking up this wonderful idea! Very beautiful and so creative. I never would have thought of attaching with thread, so simple! Thanks for the great idea. I'm just coming over from Jessa's Autumn Holiday party! Ohhh...and as soon as I seen your pretty wreath...I knew that I had been here earlier! Hehe! 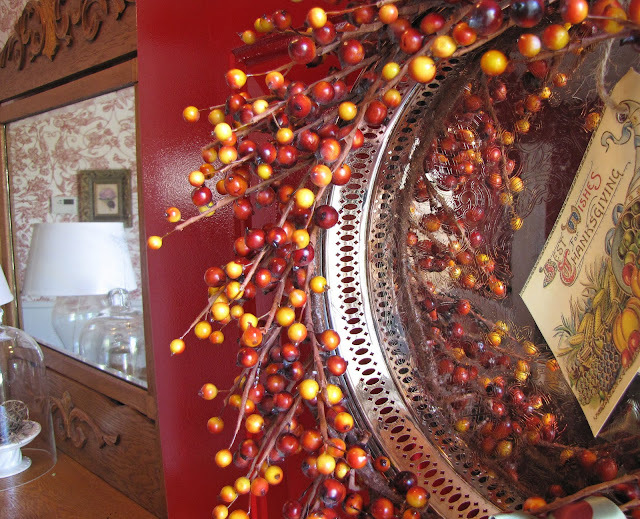 I just love this great idea of using a retriculated silver tray to make an autumn wreath! It turned out gorgeous and it's so unique! 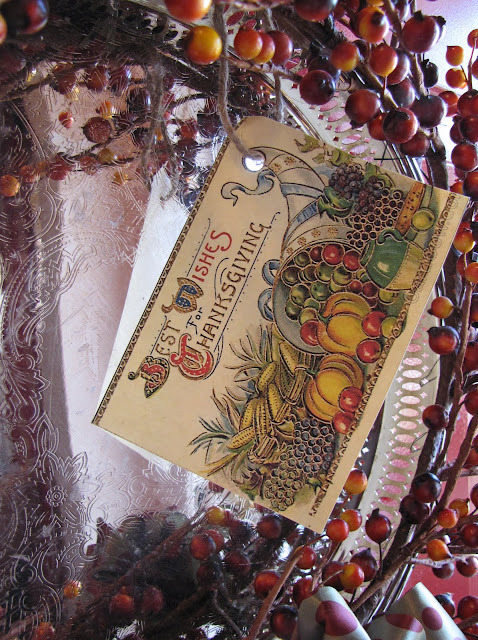 Love the details...like the vintage autumn tag that you added! Ohhh...this wreath looks fabulous on your red door, my friend!!! Thank you for sharing your beautiful wreath and the "how to's" with us! 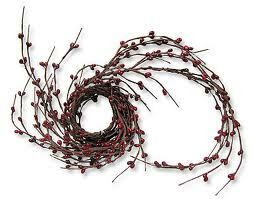 I am going to keep my eyes out for a tray like this...I'd love to make one of these pretty wreaths!!! Come be a part of my weekly meme, Seasonal Sundays! Seeming much expensive trays. By the way what will be its price? In our area it is easily available cheap trays that are almost handmade. Do you have an antique dresser in your entry hall? Could you post a picture?